The following advice was sent our way via Civic Solar. Check them out here. Clamps, the racking component used to fasten and ground modules to rails, are an integral component of a racking system. Knowing what to look for in a clamp is a great place to start when vetting racking solutions. Ideally, solar module clamps should be versatile, high quality, aesthetically pleasing and ultimately save you time on the roof. Versatile solar module clamps are important because they allow for streamlined purchasing and ensure that you always have the right materials in stock. With framed modules ranging from 30 to 50 mm in height, a clamp that can accommodate any height means that you only have to worry about stocking one part, regardless of the modules that you install. With module prices dropping, this simplicity allows you to opportunistically shift your module purchasing without having to worry about changing the racking you stock. Going one step further, the most versatile clamps will be both module height agnostic and double as a mid and end clamp. Having both of these features reduces SKU count and increases simplicity. Quality of the clamp needs to be considered because racking systems are responsible for the structural integrity of solar systems that will be around for more than 20 years. Some factors to consider are code compliance and certifications, the amount and quality of testing that has been done and the warranty provided by the manufacturer. A clamp needs to be UL 2703 Listed, which means it passes electrical, mechanical and fire testing. Be sure the clamp is UL Listed rather than just UL Classified or UL Recognized. UL Classified means it has only passed a portion of the required testing, and UL Recognized means that only a component of the racking system has passed a portion of the testing. Warranty is important because it shows the level of confidence a manufacturer has in its product. The industry standard for a racking product warranty is 20 years. Aesthetics of a clamp should be considered because sleek looking systems will increase the adoption of residential solar. For a clamp, more attractive means having multiple finish options and a hidden end clamp. Matching the color of the clamp to the color of the module frame will give the system a cleaner look. 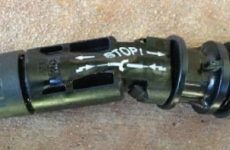 A hidden end clamp eliminates protruding rails, helping rail-based systems rival the aesthetics of rail-less while remaining more cost effective. Purchasing a clamp that is pre-assembled with a low part count and integrated grounding can save you tons of time. Now, almost all of the top racking brands have integrating grounding, where modules are bonded directly to the rail through teeth on the clamps that bite into the module’s anodized coating. This eliminates components, reduces cost and results in significant labor savings. Also, choosing a clamp that is able to stand alone in the rail channel will increase ease-of-install and turn a two person job into a one person job. 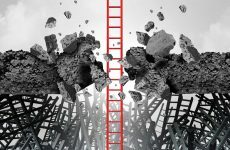 Some brands accomplish this through single pre-assembled pieces that have a robust enough end to stand alone while others use spring loaded clamps. Another consideration is whether the mid clamp has a t-bolt or square bolt end. 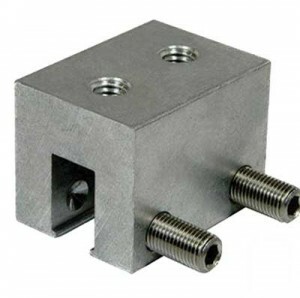 Square bolts need to be run through the rail prior to installation, whereas t-bolts can be inserted into the rail at any point. Looking for these key features will ultimately save you time and money and allow for a smoother installation process. Marisa Borelli is product manager for racking at Civic Solar. These Pre-Assembled Universal Mid Clamps have a unique T-Bolt locking feature that ensure the T-Bolt remains vertical and in full contact with the rail to eliminate pull out. The spring-loaded top clamp and open collar nut accommodates module frames from 31 to 50 mm. The added Loctite easily engages the T-Bolt from the top of the collar nut. 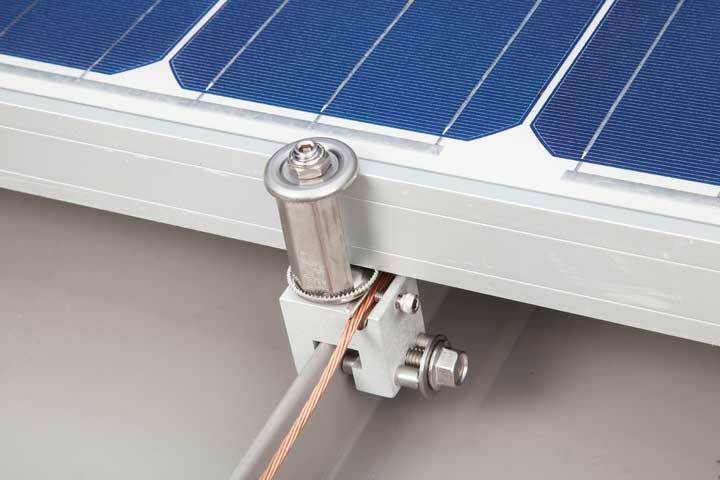 The shared rail adaptor converts standard rail to shared rail to allow landscape mounting of PV panels on E-W rails. How does it save time and cost? The SunModo self-grounding system that includes the pre-assembled universal bonding clamp eliminates separate module grounding hardware and saves installation cost. The PV Kit from S-5! The S-5-PV Kit is one of the first solar module mounting solutions to be listed to the new UL subject 2703 that covers both bonding and mounting. The S-5-PV Kit fits two grab components. The universal PV grab attaches adjacent panels, while the EdgeGrab cleanly resolves end condition requirements. S-5! clamps do not penetrate the roofing system or affect the roofer’s warranty. Fits the majority of metal roofs, including exposed fastened and corrugated. Certifications: UL and ASTM tested for use with extensive list of metal roofing manufacturers, profiles, materials and gauges. Warranty: 25-year defect warranty (applies only when the S-5! product is properly installed, used and maintained). 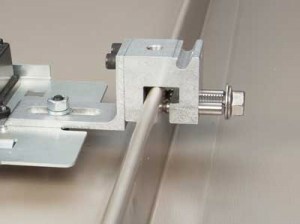 AceClamps are factory-assembled clamps with patented design features that allow strong connections to standing-seam roof panels without the use of set screws or any other loose parts that could damage the surface of the roof panel. 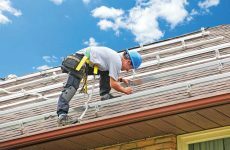 Accessories include Solar Kits for securing PV solar panels; a Micro L-Foot to mount microinverters directly to the standing seam roof rib; and a custom designed L-Foot for attaching a racking system to the AceClamp when needed. AceClamp designs have been vibration tested during the development stage and incorporate special locking features to ensure that the bolts do not back out when subjected to vibratory loads from wind flutter and light seismic activity. Certifications: AceClamp ML and A2 UL Listed to 2703; AceClamp ML approved by Factory Mutual (4471) for wind uplift attachment. A2 and Solar-Kit tested to UL 467 Grounding. 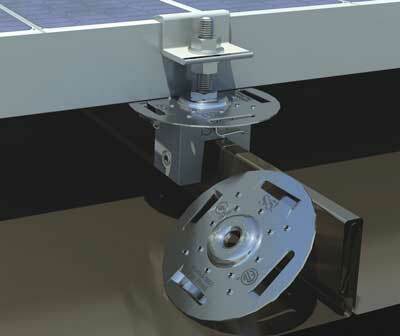 ASG-U clamps are efficient solar roof mount attachment options for any metal standing seam roof. Installation of the ASG-U clamps will not pierce the roofing material. ASG-U clamps are available in configurations for both vertical (double-lock) and horizontal (single lock) standing seams. 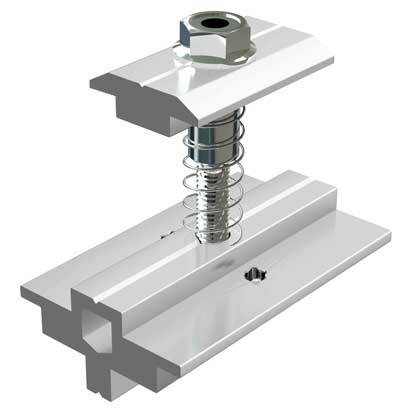 Two oval-point set screws are included as well as a hex-headed flange bolt for racking, making the ASG-U clamps not only fast and easy to install, but they will also maintain the integrity of your roof by not voiding roofing manufacturer’s warranties. This section appeared in our 2017 Mounting Guide. Not a subscriber? Sign up for a FREE subscription right here. Huge mistake to use these clamps with out a rail You are asking for severe damage to your modules since every one has it’s own clamping system and high unexpected winds will tear the modules off the roof . A rail should be attached to the clamps and the normal clamping system to the rail as this ties them all together .